With SBI’s line of pGreenZeo, pRedZeo, and pRedTK Differentation Reporter Vectors, you can monitor stem cell differentiation in real time. These vectors leverage our reliable lentivector technology and save you time—our pre-built differentiation reporters come as ready-to-package lentivector plasmids or ready-to-transduce pre-packaged lentivirus. 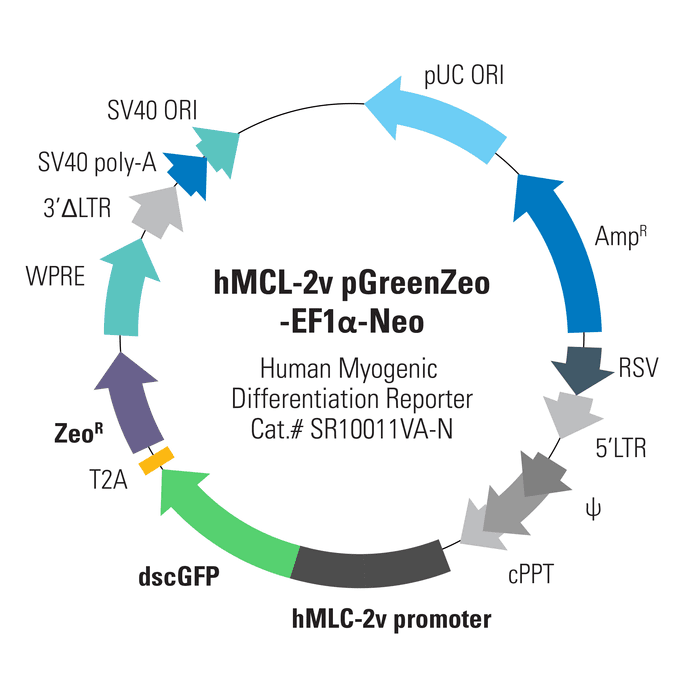 The Human MLC-2v pGreenZeo (EF1α-neo) Differentiation Reporter co-expresses dscGFP (destabilized copGFP, 2-hour half-life) and zeomycin resistance from the human MLC-2v promoter/enhancer elements, enabling visualization of myogenesis using GFP fluorescence and selection for the desired cells using zeomycin. This vector also includes a constitutively-expressed neomycin marker from the EF1α promoter.